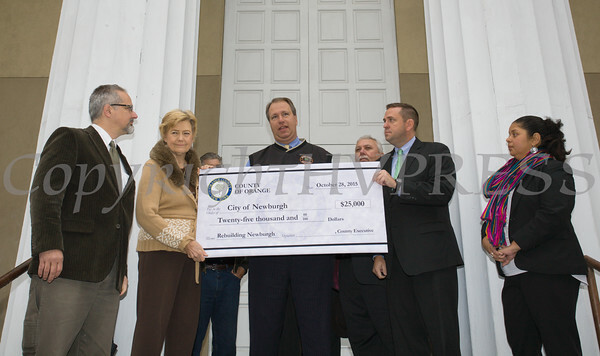 Orange County Executive Steven M. Neuhaus presented the City of Newburgh with a $25,000 check on Wednesday, October 28, 2015 to help revitalize the community. Orange County District Attorney David Hoovler offers remarks as City of Newburgh Manager Michael G. Ciaravino, City of Newburgh Mayor Judy Kennedy, Orange County Legislator James Kulisek, Orange County Executive Steven M. Neuhaus and City Councilwoman Karen Mejia listen as Neuhaus presented the City of Newburgh with a $25,000 check on Wednesday, October 28 to help revitalize the community. Hudson Valley Press/CHUCK STEWART, JR.